Our Story - M. Maselli & Sons, Inc.
"Doing a Modern Business the Old Fashioned Way" is the only way we operate here at M. Maselli & Sons, Inc. It's one family recipe that we'll never lose. It all started with two broke brothers, an old wooden building and a dream. Paul Maselli, a burnt out used auto salesman and his half-brother Jimmy Maffia, a partner in a struggling auto-wrecking business, were both looking to make something of their lives and to change the hand they were dealt. They boldly left their jobs for an old wooden building they had built on the weekends with their father. A dream inspired by their father Michele “Mikeen” Maselli, to open up a Government Surplus business, was realized. They began bidding on government surplus materials and scrap. After winning bids, they worked long hours loading and unloading materials with no forklift or dump truck but by hand, “the old fashioned way.” They decided to name the business M. Maselli & Sons, Inc., the “M” in honor of their father Mike, and the sons signifying Paul and Jimmy. In September of 1960, they opened their doors for business. Shortly thereafter in 1961 they decided that there simply wasn’t enough demand for ten tons of used nuts and bolts in Petaluma. They began buying hardware locally, then venturing to distributers in the city, taking out loans they had no business taking out to start their own retail hardware store. Paul would spend all of his time and energy into the business but one day while hand legging all of the accounting and financials he realized his dream may be deferred. It had been thirteen years and the business was still struggling. Paul and Jimmy barely had enough to get by and families and friends began to advise them to sell out. In 1973, Paul promised his wife Virginia that this was his last year in business if they were to lose money. Rolling the dice one last time, Paul Maselli bought Jimmy’s half of the partnership and hired him on to work for a consistent wage. His stubbornness paid off. In 1974, M. Maselli & Sons, Inc. made its first sustainable profit. Six years of sustainable business would go by before Jim Maselli, Paul’s son, would come into the picture. In 1980, Jim Maselli, a 19 year old energized kid, began working full time at the shop. Only a few years into employment, Jim knew things had to change. Jim and Paul got into an argument one day over some merchandising and Jim yelled with passion “Dad, soon enough, you’re going to have to learn to change with the times.” Paul took what Jim had to say to heart and soon after decided to “show him” sending Jim to his first hardware show all by himself, giving him a budget which they could afford. But when Jim came back from the show he had truckloads of garden hoses and plumbing supplies coming in through receiving. He had spent double what he was budgeted, double what they had. Paul was in disbelief, angry and troubled that the business would not be able to pay off these debts; he believed this would be the business’ final demise. Contrary to his doubts, M. Maselli and Sons did sell all the garden hoses; in fact it’s still selling garden hoses to this day. Although it was a risk, Jim’s words proved to resonate long after just as his father’s risk paid off in 1974. The store has been completely remodeled twice since then and a new generation of Maselli’s is in the mix. The gears are still turning today due to a few bold moves and a lot of hard work over the years. 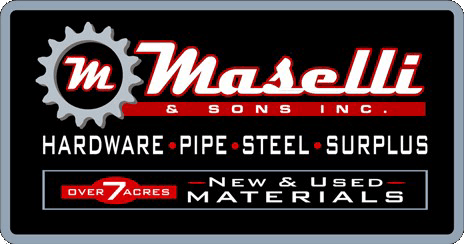 M. Maselli & Sons, Inc. is founded through old-fashioned principles, but is not afraid to “change with the times” and operate in a modern way. "Doing a Modern Business the Old Fashioned Way" is the only way we operate here at Maselli’s. It's one family recipe that we'll never lose.